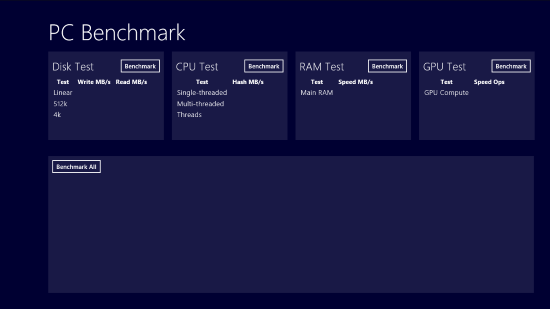 PC Benchmark is a free Windows 8 and 8.1 App to benchmark your PC. Released by Jujuba Software, this is a really useful software to checkout your computer’s performance. This PC Benchmark tool performs several tests on your Windows computer to calculate various PC performance parameters. 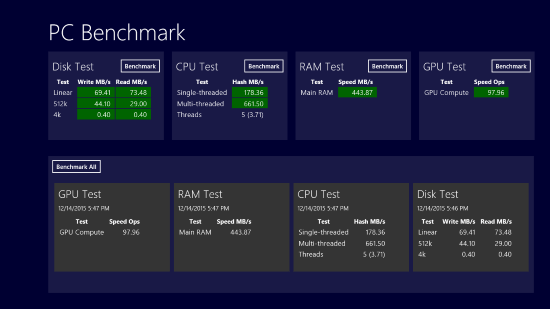 Benchmark your PC with the calculated Disk, RAM, CPU, and GPU parameters. You will find this App to benchmark PC on Windows App Store. Go to the Search Box, and type Benchmark PC to find it. The App page link is also given at the end of this article. Click the link to download this app to benchmark PC. The size of this App is 379 kB, so it hardly occupies any space on your computer. Click on Install to automatically download and install this App. Disk Test (HDD/SSD): This app to benchmark PC, tests your PC’s disk by displaying its read and write speeds. The Read and Write speeds are displayed in MB/s for Linear, 512k, 4k data. CPU Test: The processor is put to test to display Hash in MB/s for Single Threaded, and Multi Threaded data. It will also display the number of threads. RAM Test: Its too important to know how your RAM has been performing. 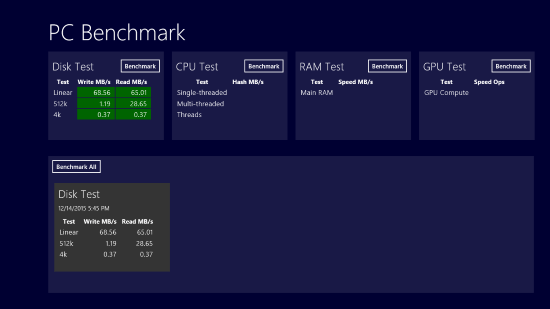 Perform the RAM benchmark test to view the Main RAM speed in MB/s. GPU Test: The GPU (Graphics Processing Unit) controls the output display of your PC. Put your GPU to benchmark test to know its Speed Ops. Now, you can either Benchmark each of the above one at a time, or all of them at once. Click on Benchmark buttons of any window, which you want to test. Click on Benchmark All to begin the test at once. Wait for a while for the test to complete. You can view the resulting speeds of GPU, RAM, CPU, and Disk in the green boxes. This is one of the most accurately working Windows App to benchmark PC, and does not consumes much time. This App can replace many unwanted desktop apps from your PC. This Windows App to benchmark PC is compact, fast and accurate without any doubt. It lacks ranking option where you can compare your PC’s speed with other PCs.